Next week, April 11-14, SparkFun is heading to the National Science Teachers Association Conference in San Antonio, TX. The conference's theme is "Next Generation Science: Learning, Literacy, and Living," and will focus on Next Generation Assessments, Next Generation Elementary Science, Next Generation Special Populations, and Next Generation Technology. 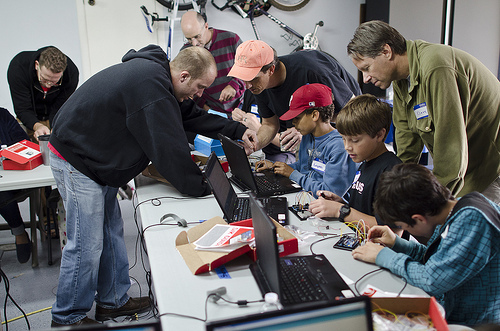 For its part, SparkFun will be teaching "Intro to Arduino on the ProtoSnap" as well as bringing educational resources. We'll be talking about some of our favorite learning tools, like LogicBlocks, the PicoBoard, e-textiles and e-origami. SparkFun Educational Coordinator Lindsay Craig will be showing people how we teach oscillation and clock signals to elementary and middle school kids. If you're going to be at NSTA, be sure to stop by and say hi and talk shop - we'd love to see you! Woohoo! A gathering on next generation (Common Core?) assessments and special populations. You are in for a load of fun :-) Love to see a report on whether it is worth the trip. You guys are very likely to the the high point for most attendees.